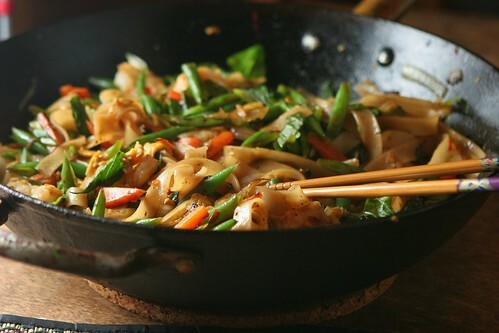 There are way too many recipes out there that I want to try. Andrew made me an app a while ago to store my magazine recipes (being married to a software developer definitely has its perks), and I've got more than 450 recipes in there. Not to mention all the recipes in my collection of ~60 cookbooks and all the ones in the cookbooks I have on my wishlist...Andrew like to complain that when I make something he really likes, it's pretty much guaranteed that I won't ever make it again - but in my defense, why repeat recipes when there's always something new to try? Anyway, I was looking through my collection of magazine recipes the other day and decided to try this recipe for baked beans, which I saved back in 2011. I tweaked it a bit, adding a chipotle chile for extra smokiness and heat, and adjusting the sugar to suit my taste. 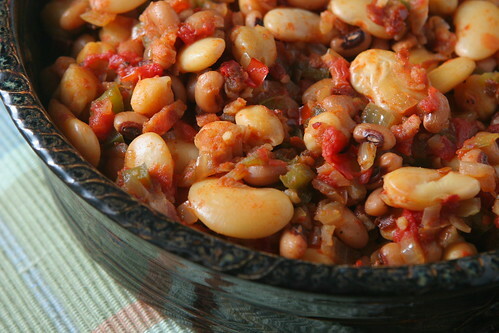 The beans were the perfect mix of smoky, sweet, and spicy, and the three different bean types add variety in shape and texture. Good thing I obsessively keep track of interesting magazine recipes, or I never would have tried this one! Believe it or not, tomorrow is the first day of spring. If you live in the Boston area, then you probably know better than to get too excited about that fact. Although this week last year brought us temperatures in the 70's and trees blooming with flowers, this year brought us snow and freezing rain. Winter is certainly not over, and as anyone around here will tell you, it's not unheard of to get snow well into April. With the weather being so cold and wet, I thought it would be appropriate to post about soup (and I'm not the only blogger who felt this way). This carrot soup recipe came from Bon Appetit - the base soup is simple, just carrots and broth, but the carrots are roasted to give it extra depth of flavor. The toppings are what really make the soup special though. 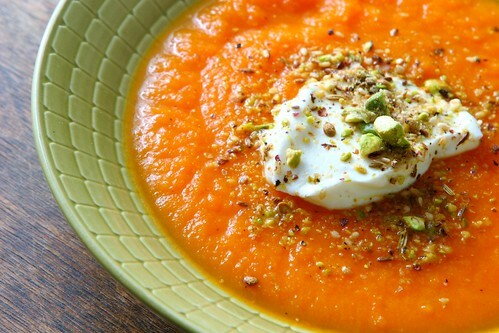 The yogurt adds some nice acidity, and the dukkah spice (an Egyptian spice and nut blend) gives the soup complexity. The soup is thick and filling and will definitely keep you warm while you wait for spring to arrive! I've recently been thinking about having a tapas-style dinner party, where I make a whole bunch of appetizer selections instead of a main dish. I was collecting recipe ideas (although I haven't planned the actual party...) when I came across this one in The Food52 Cookbook. As soon as I saw the recipe, I decided that there was no reason to wait for a party when I could make these on a random Sunday evening instead. I'm glad I made that decision, because it meant that Andrew and I didn't have to share! 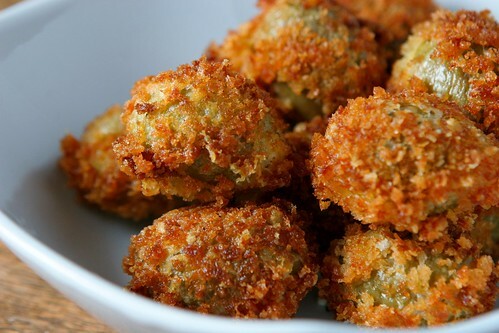 These olives were awesome - crunchy and salty and cheesy, really the perfect party snack (even if it's just a party of two). When Andrew and I were in Turkey over the summer, we tried a traditional dish called manti, which consists of a ravioli-like dumplings filled with meat and topped with yogurt and spices. I loved it - the yogurt sauce was creamy and tangy and paired well with the dumplings. Yogurt and pasta may seem like an odd combination at first, but it is commonly found in certain Middle Eastern cuisines, and it's not that far off from the yogurt rice eaten in India. This recipe came from Jerusalem - it's not the same dish I tried in Turkey, but it's in the same family. Here, the sauce includes yogurt, feta cheese, and pureed peas. 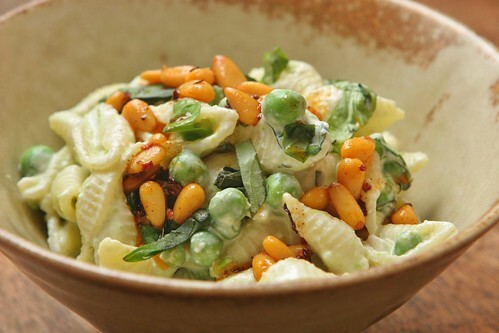 The pasta is tossed with more peas and basil, and topped with pine nuts that have been cooked in a spicy chile oil. 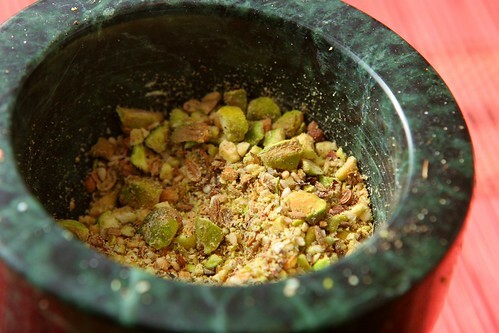 The pine nuts and chile oil really make this dish - the nuts add texture and the chile add another dimension of flavor. The chile oil is very spicy though, so cut down on the chile flakes if you are sensitive to heat! A note on the Jerusalem cookbook - this book is by Yotam Ottolenghi, the author of Plenty. You may remember me talking about how much I love Plenty, and Jerusalem is just as good (although fyi - it's not vegetarian). I love the big flavors and creative combinations of ingredients in Ottolenghi's recipes and his cookbooks are always a good source of inspiration. I definitely highly recommend this one. Wow, it has been a long time since my last post...I've been cooking a lot but haven't really been inspired to blog about any of it. But I was recently reminded of how nice it is to share recipes and food stories with others and it made me want to get back here and post something. And between the snowy weather this weekend and the fact that I've been down with a cold, I've been spending a lot of time on the couch paging through cookbooks and bookmarking recipes. I've got quite a list of things I want to try in the next couple weeks, and hopefully some of the recipes will be good enough to share! I don't know about you, but snowy days make me want to bake. The apartment just seems extra warm and inviting when it is filled with the scent of baked goods. I came across this recipe when I was looking for something to bake using the Meyer lemons that I recently bought. If you haven't tried them, Meyer lemons are sweeter and more aromatic than regular lemons. They're only in season for a few months, so I try to grab them when I see them. 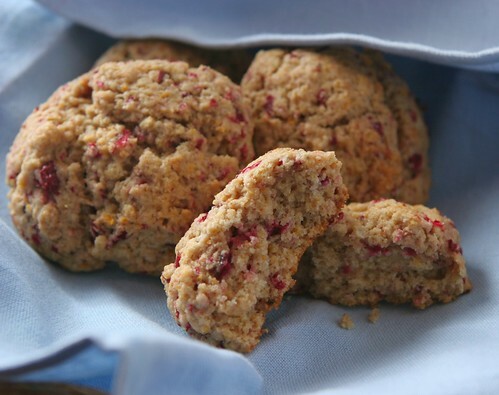 The Meyer lemons work beautifully with the cranberries in these scones. 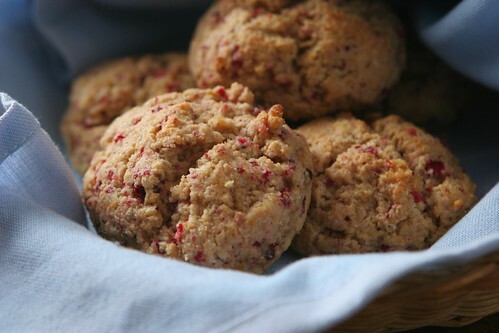 The scones are fragrant and light, and have just the right amount of sweetness to offset the tart fruit. 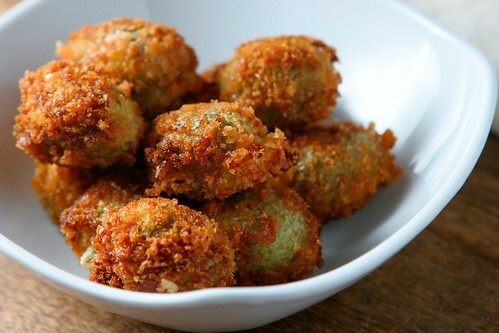 They're perfect for breakfast or as an afternoon snack with a cup of tea. I mentioned recently that I received a copy of Bean by Bean for Christmas. This book has been on my wish list for a while and I was really excited to get it - I cook with beans a lot and am always looking for new recipe ideas. When I was flipping through the book and tagging recipes to try, I came across a recipe for socca (chickpea flour flatbread). It made me remember that I still had chickpea flour in the pantry and that I should make socca more often (I've only made it once before). The recipe in Bean by Bean was different than the one I used before so I decided to try it. This crust recipe is really phenomenal - the socca is deliciously crisp on the outside and tender in the middle. 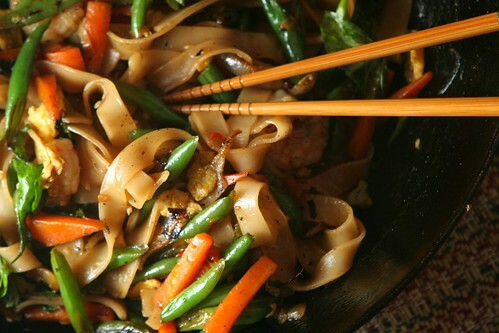 Don't try to cut down on the amount of oil - you need it to get those addictively crispy edges. 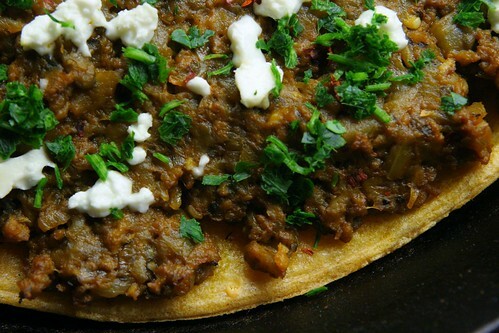 The lamb-eggplant sauce is meaty and savory and goes very well with the chickpea flavor of the crust. 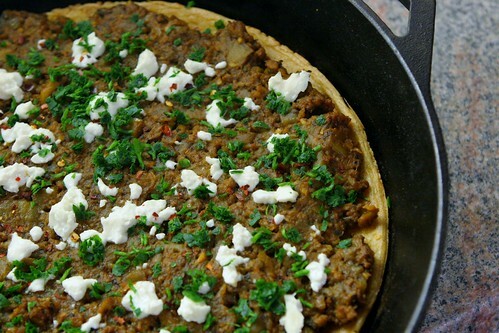 If you're looking for interesting variations on traditional pizza, give this one a try! I'd love to hear other topping ideas that you come up with as well.